Testing by code is called test class. 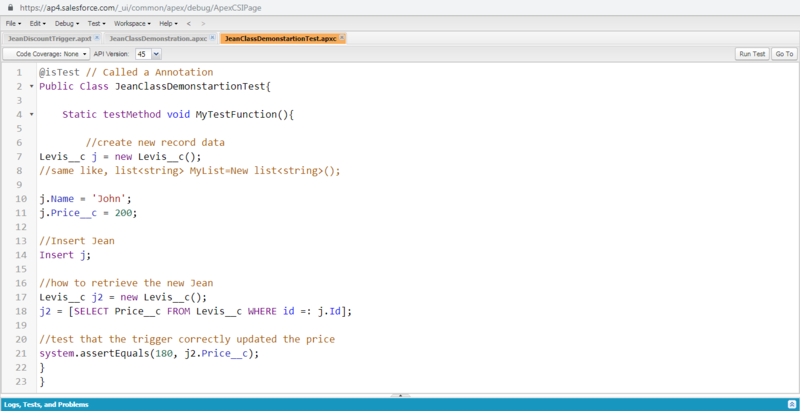 Test Class: When we write any business logic in sandbox by APEX Class or Trigger, then we need to do testing of the same. The testing we do refers to manual testing by any QA guy. The only difference is, he/she will do manually and we will do by code - which is called a Test Class. This is something rare in other programming languages. What and why the code should be passed with 75% and above to move for the production and why is that required? How to Open Trigger from Anonymous Window? How to Open APEX Class from Anonymous Window? The minimum code for approval for APEX class & Trigger is mentioned below. Test Class Name : JeanDiscountClassTest. 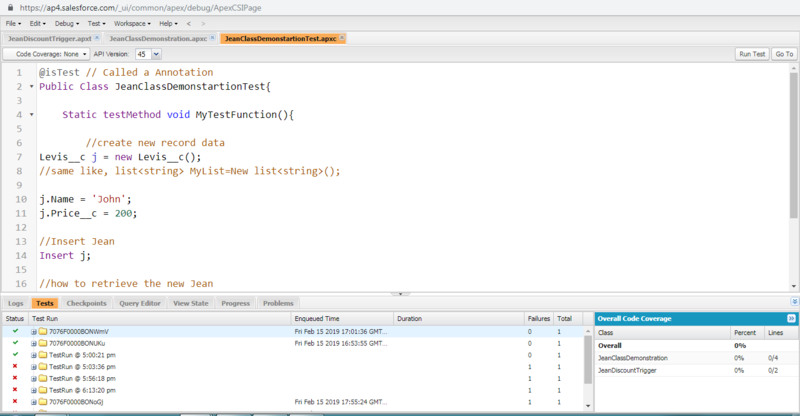 Test Class Program For Testing: Before performing the test class execution, we need to create an Object and write a trigger class & APEX class function for inserting, updating, & deleting the data from the Object. The Above Test Class is for JeanDicountClass. Please save the code properly, after “Save”(Ctrl + S), You will be able to visualise the “Run Test” button at the top right corner of the page as shown in the below figure. This button is available only for the Test Class, not for any regular class. Before pressing the Run Test Button, check with the main APEX Class - (JeanClassDemonstration). The below figure shows the MainClass with code. Check with the main class - trigger also, as shown in the figure below. Note: At starting in the Trigger Class - Code Coverage is 0% and the APEX Class - Code Coverage is 0%, We need 75% code coverage from APEX Class and 1% from the Trigger Class. And, we must run the test from the Anonymous Window with - “JeanClassDemonstartionTest” and look for the test results. We can also run the test APEX class from the Setup → Develop → APEX Classes → Select the Desired Class to test(JeanClassDemonstartionTest). Developer Console → Anonymous Window → File → Cntrl + O or Open → Entity Type(Triggers) → Select the “Trigger”(JeanDiscountTrigger). In the above format, the required trigger, APEX Class, Test Class are opened and now, you must run the test in the Test Class Window by Clicking the “Run Test” button from the top right corner of the page. In the next topic, we will discuss in-detail about “Test Class Explanation”. Keep following us for more info on Salesforce Development / Programming.